Who doesn’t want to increase traffic to their site? I know I do, and I’m sure you do too. But where do you begin? What’s the first step? You are also probably wondering how much you need to do to start seeing the effect of optimizing your site. Right? Take a deep breath. Getting found in the search engines is not as scary as you might think. You will see results with just a few basic steps, though you can go deeper if you wish. 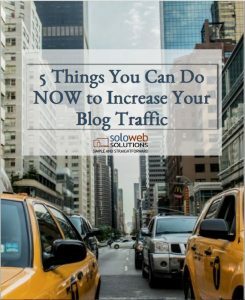 5 Things You Can Do NOW to Increase Your Blog Traffic will walk you through the basics of optimizing your site. If you follow the steps outlined in this eBook, your audience will be much more likely to find you on the internet. Consequently, your audience is more likely to buy from you. They definitely won’t buy from you if they can’t find you. We will focus on five things you can do right now to increase your ranking. They are the bare minimum you should implement to increase your traffic. The best part is that you can easily implement them! It can be very rewarding to watch your site rank higher on the search engine results page (SERP). The SERPs page is the page you see when you do a search in Google or other search engines. Why not click on the link and get started today? You will be directed to a sign up page.